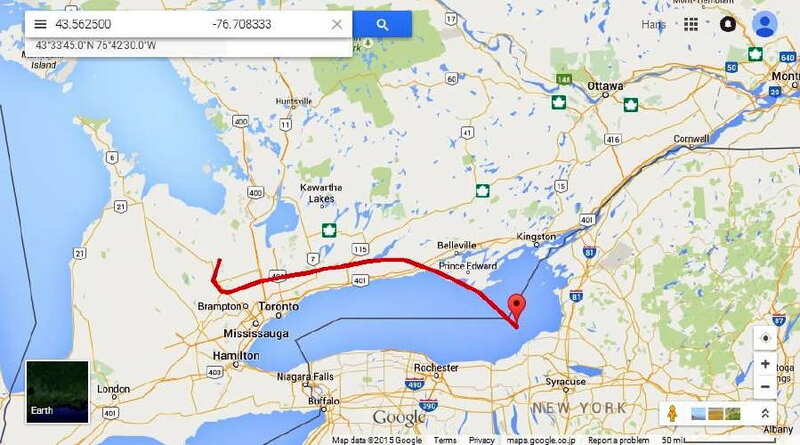 From the website of Hans Summers (GØUPL) comes news of a 3rd balloon launch from Canada. 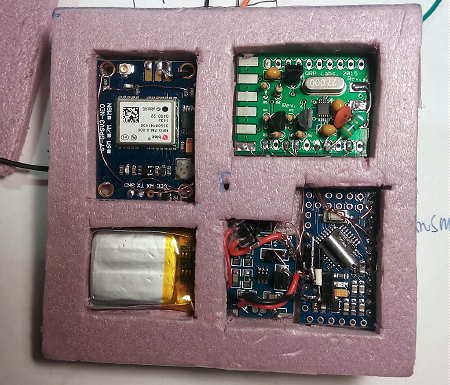 David, VE3KCL, used a special U3 firmware version of one of the kits available from QRP Labs and an Arduino Nano board driven by a QRP Labs Si5351A Synthesizer board. 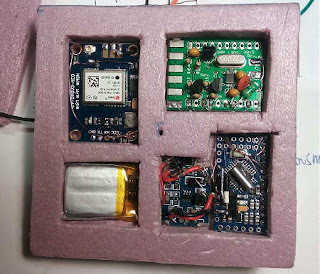 Special WSPR codes were used for vehicle telemetry which sent Callsign, Power, Locator, Altitude, Temperature, Battery, Groundspeed, GPS Status and Satellites Found. 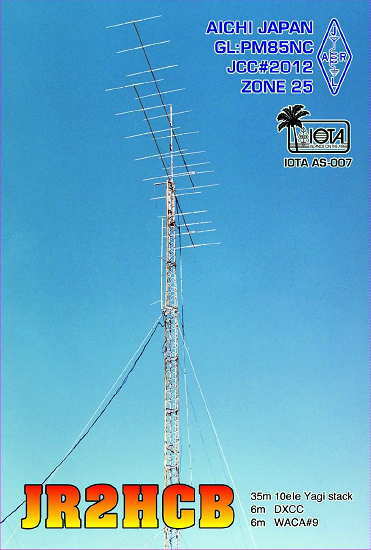 A 30m HF data download link was used with the help of a full-sized dipole hung between the system's two support balloons as well as a CW identifier on several other bands. David VE3KCL launched his third balloon flight S-3 on 28-Jul-2015 at about 11:40Z. Like the former S-2 flight, this one also uses a special U3 firmware version on an Arduino Nano board, with QRP Labs Si5351A Synthesiser. 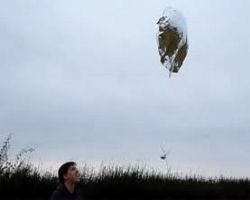 Two foil "party" balloons were used, filled with hydrogen. The earlier balloons S-1 and S-2 apparently suffered burst failure before reaching float altitude due to polluted gas mix - there was a lot of propane mixed in with the hydrogen. This flight S-3 successfully climbed to almost 8,000m so this problem is now solved. FYI VE3KCL's S-3 balloon survived the night, woke up at around 1100Z when daylight restored power to the solar cells and the battery changed a bit. 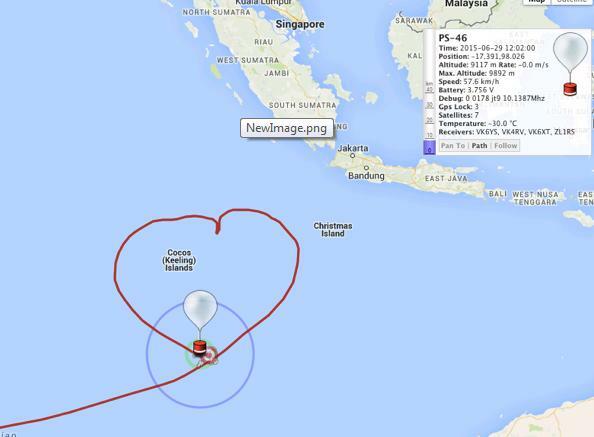 It is currently cruising at 7,660m in locator FN20DD, about 50km North-West of Philadelphia, US. I will update the map and data graphs at the end of the day. More information and pictures of VE3KCL's adventures can be viewed on the QRP Labs website. For those who are software-savvy, it looks like a simple system could be put together with some of the available kits. 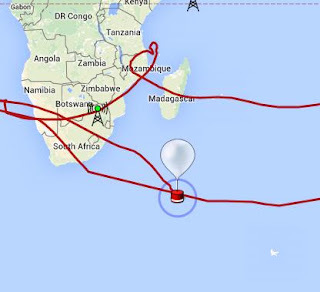 On another note, it does appear that Andy's amazing Pico-Sat balloon did indeed go down, south of Madagascar, after almost completing its 3rd circumnavigation of the globe. I receive a lot of e-mail from both hams and future hams that are struggling with CW. 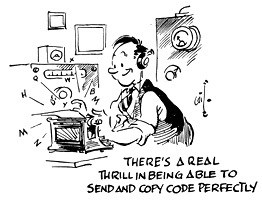 It seems there are a lot of hams that don't operate any CW simply because of their code skills. For myself, learning CW as a pre-teen, was a bit of a struggle, as I learned CW from flash cards ... definitely the wrong way. In my case, the code was learned in order to operate an Aldis lamp signalling system for my scouting activities. When eventually switching to a hand key and buzzer, I had to make the mental switch between the picture of the flash card and the sound of the code, taking me much longer to reach my goals than if I had learned just by sound. If I were learning the code today, or if advising anyone struggling with CW, I would suggest several ways of making it easier. 1. Too many newcomers want to learn CW using a keyer. Put the keyer away and get yourself a hand key. It need not be fancy or expensive. 2. Use the hand key to practice sending similar-sounding letters (E, I, S, H etc) slowly and correctly. Don't be concerned about sending them fast but concentrate on getting a uniform spacing between each element of the letter. As you slowly learn the letters and how they sound, you will find your sending speeding-up, unconsciously, as you progress. 3. Combine your sending practice with receiving practice and try to do 10 minutes of each during each practice session. One session per day will guarantee success, if you stick with it. If you can't do it every day then try and commit to every other day. 4. For receiving practice, use a much higher speed than what you are sending at. Once again, in sets of similar-sounding letters, try and learn the letters when sent at a speed of at least 15WPM, but with wide spaces between each letter ... so they aren't coming at you as fast. This is the Farnsworth method of learning code. Learning what the letters sound like when sent at a fast speed will eliminate the dreaded 'learning plateaus' associated with learning at slower speeds, when you can get stuck at a lower speed for some length of time. I only wish that I had known of this method when I was a kid, but I don't think it had been thought of back then. 5. There are lots of websites that will help you in Step 4 and one that I have played with seems to work very well. You can set up a slow-speed spacing but have characters sent at 15WPM or faster (start with 15WPM). You can pick only the letters that you wish to practice (T,M,O,A,N etc) and then get a printout of what was actually sent to check your accuracy. The one I tested is by AA9PW and can be found here. In addition, the ARRL's W1AW, provides nightly code practice on various frequencies and also provides archived CW practice sessions at various speeds via their website here. Once you become somewhat competent in both sending and receiving, don't be afraid to get on the air and use your new skills. Don't be concerned about sending fast and be careful about sending faster than you can receive, an easy trap to fall into. There are always several stations around 7.110-7.125 every afternoon and evening that seem very happy to communicate at comfortable speeds. If you don't get on-the-air, then make sure that you still do your daily 20 minutes of practice. You will be amazed at how quickly you can learn the code or increase your speed, with this daily routine. This short daily commitment to practice (on the air or otherwise) is the key to success. If you aren't using CW, you are missing out on a lot of fun. To this day, CW is still my favorite mode and almost 100% of my on-air operating is on CW ... it's just plain fun! Knowing how to use CW will open up a lot of opportunities to enjoy it ... CW contesting, chasing DX, CW nets, staying in touch with friends etc ... CW will always get through better than phone under most conditions. So ... if you have been struggling with the code, or putting it off, there's no time like the present to join the fun. Hopefully you will find these suggestions helpful. Six meters delivered a mid-afternoon surprise yesterday, with a brief opening between the west coast and Japan. It was one of those openings that would have been missed entirely, a few years ago. 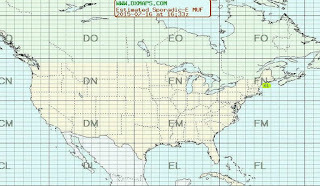 At around 2300Z, JE1BMJ (Han), announced via the ON4KST 50MHz chat page that he would be CQ'ing towards North America on 50.090KHz. I was working at the bench with the receiver running in the background and took a moment to turn my 4el yagi towards Japan and put the receiver on frequency. Nothing was heard for several minutes when, as if a switch had been thrown, the frequency became alive with CW sending "... DX K". About 20 seconds later it started again, a CQ DX from JE1BMJ. It is amazing how often the band or a path will appear to suddenly open, in this case, at just the tail end of Han's CQ ... not a whisper of anything before the very tail end. As I listened, his signal built from the initial 559 to 579 at which point I called and we exchanged signal reports. As mentioned earlier, this was an opening that would probably have been missed a few years ago, for several reasons. One factor is the growing use of the Internet to spot activity or stations that are actually on-the-air in real time. Another reason is the very short window of opportunity. 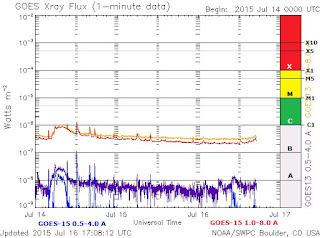 Without stations looking, thanks to Han's QRV announcement, it is probable that nobody would have been pointing towards Japan at that time of the day ... but, more likely, the biggest reason is the exploitation of the SSSP path between NA and Asia that has become somewhat of a regular occurrence over the past several summers. SSSP or Short-path Summer Solstice Propagation is the mechanism uncovered by JE1BMJ in 1999. In that year he discovered that his signals could be heard almost daily in many parts of Europe by transmitting on a regular evening schedule. He then turned his attention to North America, in the morning, and found much the same thing. Han continues to this day on a regular schedule each day and more often than not, works several stations in North America ... from both coasts and everything in between. He has even worked into Central America on SSSP. 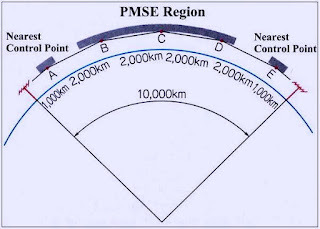 SSSP is a summertime-only event in the northern hemisphere and relies on the scattered ice crystals found in the Polar Mesospheric Summer Echo region (PMSE), located about 88km above the ground, very near the same height as the E-layer. Signals travel through the polar region and never touch the ground until the far end of the path is reached. In all probability, this is the same mechanism that west coast stations are able to work transpolar-Es into Europe during the summer. The season is short-lived (June/July) and openings can have weak rapidly fading signals or, as in yesterday's case, strong steady signals during the course of the opening. Openings can last from just a few minutes to several hours. Thanks to the Internet and real-time chat, most of these openings are no longer being missed. Stations being worked via SSSP seem to be, for the most part, running high-power and / or large antenna systems. 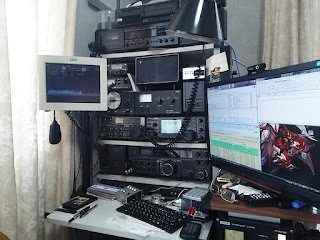 It is rare to work many of the 100 watt stations, although under good conditions, it does happen. For the major portion of my 45 years of activity on 6m, working Europe in the summer was never even dreamt of. Late-night openings to Japan, were however, fairly regular and could be counted upon at least once or twice per summer. Both of these paths are now a regular occurrence, with the path to JA being more common than the path to Europe. As Han speculates in his paper, it may have something to do with the growing warmer temperatures in the polar regions due to greenhouse warming effects. If this is the case, perhaps we will see even more of these types of openings in the future. 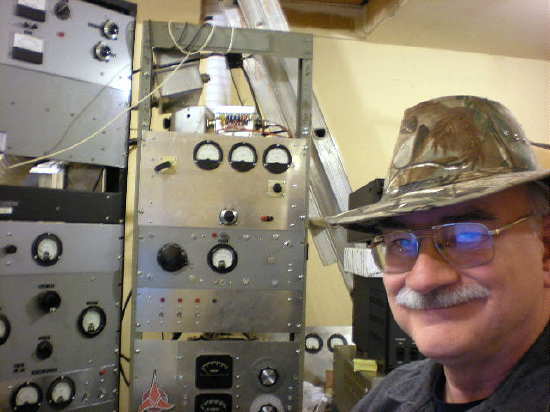 Late last month I made mention of a truly amazing 50MHz contact. It was the QSO made by K7CW (Paul, in Tahuya, Washington) with HVØA (operator Francesco, IKØFVC) at the Vatican. Working the Vatican station is tough enough on HF, but snagging it on 6m, from the west coast, is truly a once-in-a-lifetime experience ... some even described the QSO as 'miraculous'! June 21st was one of the better days of this year's poor Sporadic-E season. 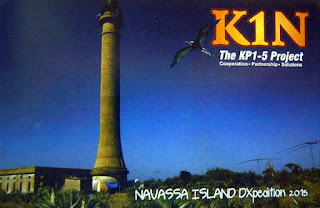 Stations in the western part of North America had an early-morning opening to the Caribbean as well as to South America, when YV1KK was worked by stations in the PNW region. Here's how it happened here. I hadn't been paying attention to it, but N5DG had worked HVØA. Somebody mentioned that HVØA was going to QSY to 50.078 and was going to be looking for NA. I thought this choice of frequency was odd because some Europeans are not authorized to use frequencies below 50.080. But, I decided to go down there and check it out, because doing that has often paid off (re the CYØX QSO which brought me to start doing this). The propagation to the Caribbean and northern South America was demonstrably quite good (I worked my first YV), so checking out this European spot made even more sense. I swung my beam up to a heading that I thought was good enough for Italy and tuned down on .078. Fortunately, there were no beacons coming through on that frequency, so I could concentrate on digging out any weak signal that was there. I slowly tuned around .078 and, for a while, heard nothing. After a few minutes, I began to sense that there was some tonal quality to the noise (musical noise). It was just there as no more than a hint, but I slowly tuned it so that it matched the frequency of my CW sidetone. I hoped that the other station (if there was one) would also have his filters set the same way. When I thought I had it about right, I switched in all my CW filters to the tightest setting (50 Hz) on both my transceiver and also my JPS NIR-12 outboard DSP filter. When I did this, the signal to noise ratio improved so well that I immediately started copying, "CQ NA CQ NA de HVØA HVØA" He was solid copy, but I needed those tight filters. I got his attention on the first call! He called me back using K8CW and gave me 599. I'm sure he was receiving me well, but probably didn't believe I was a 7. He kept calling me K8CW and I kept correcting him. I gave him a 599, too, but it was just a jerk-knee response that someone might do upon being the object of a miracle. But he was solid copy. After our QSO, I stopped hearing him. I logged him at 1631Z. The spotting record shows that N5DG and K7CW were the only North American stations to work HVØA on June 21 on 50 MHz. So, that's my side of the story. I happened to be listening to the exchange myself but heard nothing from HVØA although two Italian stations were heard over the next few minutes. No magic for me that day but kudos to Paul and his fine station, as well as to Francesco, for the heads-up operating and being on top of the short propagation window that morning! These are the moments that 6m diehards live for, especially those on the west coast ... reminding us once again why the 'magicband' deserves its well earned moniker. 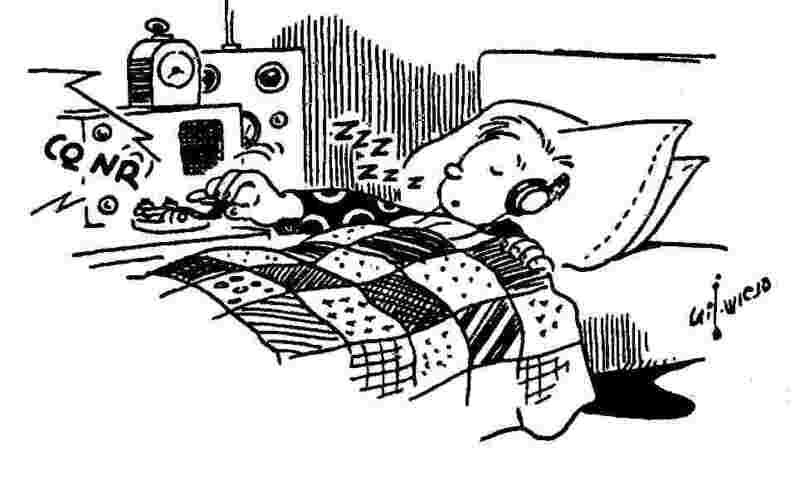 There has been a lot of discussion lately regarding the upcoming ARRL's review of DXCC requirements regarding, amongst other things, the use of "remote" stations. It seems that most folks are either dead against them or all for them, with little middle-ground. But one thing is for certain ... remotes are here to stay and are growing by leaps and bounds. The biggest controversy seems to be whether DX worked via a remote should count the same as DX worked from one's home station. Many think that DX worked via a remote should still be countable for your DXCC credits but should be in a separate class or have a separate endorsement indicating such ... others see no separation is needed. I guess a lot depends on how one views the DXCC program overall. Some see it as a competition against other stations while others view it is a personal challenge for one's own satisfaction and the only competition is with one's self. For example, if a New England 160m amateur spends many years perfecting his system and struggles for those hard-fought Asian or South Pacific contacts, should these contacts be held in the same regard as the New Englander's 160m neighbour who works all of the Asian-Pacific with ease via a remote station on the west coast? Should both DXCC certificates be the same? There is also the question of remote stations "for rent" and the overall ethics or "legality" of such within the amateur radio service. The only direct exposure I have had to remote station operation is hearing what was clearly an east-coast remote being operated by an amateur on the west coast, while working Europeans. No problem with that, however, the operator was giving his location as CN87, Washington state ... clearly deceptive, as many Europeans were delighted to think that they had just worked a new state in "7-land"! I suppose that no matter how strict the "rules" for remote operations eventually become, there will always be those willing to play by their own rules, as is human nature. 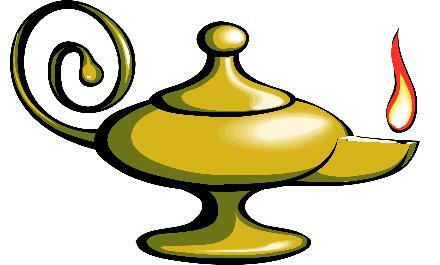 The genie is out of the bottle and there is no going back. I think the ARRL has some tough decisions to make ... hopefully they will be well-thought out and not based solely on financial interests. I have added a 'Quick Links' section along the right side of my blog. Here you will find links to noteworthy blogs on my site without having to sleuth through the entire listings. Those of you reading my blog on amateurradio.com will not see these but they can be viewed on my actual blog page here. 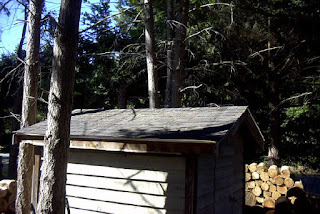 Now that my two major outdoor summer projects have been done, the re-roofing of my yard shed as well as the woodshed roof, I can get back to concentrating on more benchwork soon. The hardest part of the roofing job was stripping the old cedar shakes (23 years old) and then sheathing the roofs with plywood. The actual laying of the new asphalt shingles (Malarkey) went very quickly. 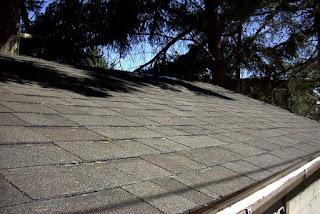 This was my first exposure to shingling and I learned a lot ... hopefully growing some new brain cells in the process. It's a good thing that 6m hasn't been open much at all this summer as I'd still be up on the roof. I've just checked the progress of Andy's PS-46 'PicoSat' balloon. It left the east coast of South Africa several days ago, streaking towards the Indian Ocean at 40,000 feet ... however it has not been reported for two days now. When last heard it was 500km south of Madagascar heading SE. It had maintained 27,000 feet after leaving the African coast but then suddenly starting losing altitude over a 7 hour period. It was at 6,000 feet on the last report. Hopefully PS-46 is just in a radio-quiet zone in the south Indian Ocean and will pop-up again as it nears Australia. It was well on the way to completing its third circumnavigation of the planet but one wonders just how long PS-46 can go on. This summer's Sporadic-E season has been the worst in memory, for myself and for most North American six-meter fans. My last log entry, and the last time that I heard a signal on 6m, was on July 7th. During a 'normal' season, rarely a day goes by without an opening in some direction. Often, the band will be open for several days in a row. It was only a few summers ago that the PNW region had propagation to Europe (extremely rare) for three days in succession! There has been much speculation as to why this season is particularly poor. Is it the early higher-than-normal temperatures being experienced this summer? Is it the constant bombardment from the sun, with several solar flares during the prime weeks as well as an almost continuous coronal hole streaming? Is it all just a normal part of the cyclical behavior of most natural phenomena? Whatever the reason, time is running out for this year. After operating on 6m for over 40 years, the peak conditions always seem to happen during or close to the first week of July ... but, living up to its 'sporadic' classification, I have seen some spectacular openings right up until early August. In fact, my longest 2m Es contact (Oklahoma) was made on July 24, so there is still some time left for the band to exonerate itself. With the sun flatlining once again, and no sign of flaring or no coronal hole streaming, perhaps the next few days will turn things around. If not, the summer of 2015 will be notable for not being notable. One great opening over the pole will make the poor conditions just a distant memory! So much for that prediction! I had to do a memory refresh but finally recalled that Leif Svalgaard, et.al. potentially the smallest cycle in the last 100 years." 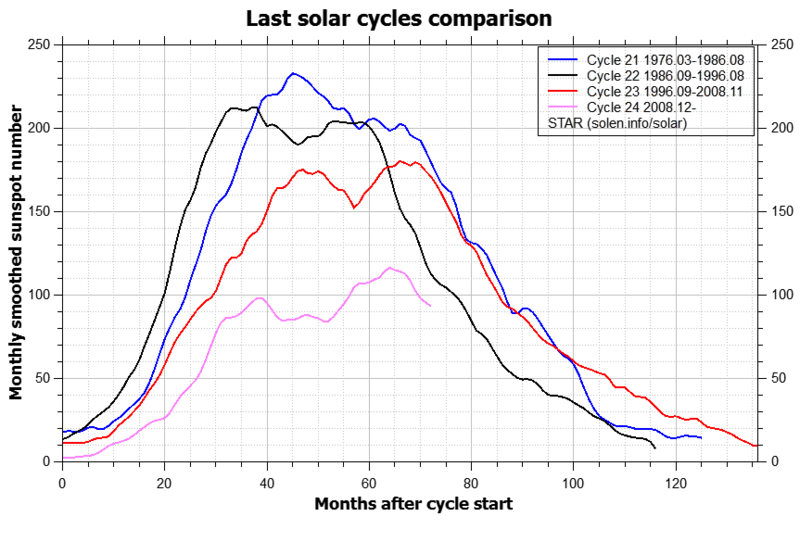 occurred during the cycle's second peak. But Svalgaard wasn't the only one with an accurate forecast. Searching for a less-gloomy outlook for upcoming Cycle 25, I happened upon a paper by Hamid Helal and A.A. Galal of the National Research Institute of Astronomy and Geophysics, in Cairo. 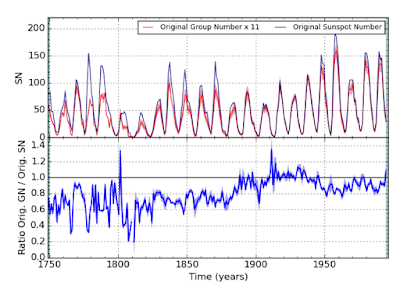 In "An early prediction of the maximum amplitude of the solar cycle 25", the authors cite a methodology that was bang-on for the last three cycles and gives a very optimistic outlook for Cycle 25. Table 2 gives our prediction for cycle 25 in comparison with the published predictions of other authors in chronologic alphabetic order. It is obvious that our results agree with some contributions and disagree with others. In fact the differences of the predicted strengths by different authors may be attributed to the variety of the used techniques and methodology. Although some authors think that cycle 25 could be one of the weakest in centuries, in contrast, we think that the next cycle will be relatively stronger than cycle 24 and it will have nearly the same strength of cycle 23, i.e. the sunspot maximum may rebound in the near future. If Cycle 25 is comparable to Cycle 23 it will be happy days again ... it was a very robust cycle and provided several winters of high F2 MUFs, leading to day after day of amazing 50MHz propagation! I'm somewhat vexed about which scenario I'd prefer, being both an LF'er (quiet, weak cycle) and a diehard 6m guy (chaotic, strong cycle). In any event, Cycle 25 will likely be the last one of any interest to me. I was born at the peak of Cycle 18 ... you do the math! Obviously it will be a few years yet before we see who is right, but I'm kind of pulling for Helal and Galal's big numbers for one last 6m hoorah! Britains' Royal Astronomical Society has just announced yet another new model of the Sun’s solar cycle ... one that is producing unprecedentedly accurate predictions of irregularities within the Sun’s 11-year heartbeat. If the model is correct, the outlook for the next several cycles does not look good. The modelling describes the interaction of two levels of the sun ... one near the surface and one much deeper. "... found magnetic wave components appearing in pairs, originating in two different layers in the Sun's interior. They both have a frequency of approximately 11 years, although this frequency is slightly different, and they are offset in time. Over the cycle, the waves fluctuate between the northern and southern hemispheres of the Sun. Combining both waves together and comparing to real data for the current solar cycle, we found that our predictions showed an accuracy of 97%." 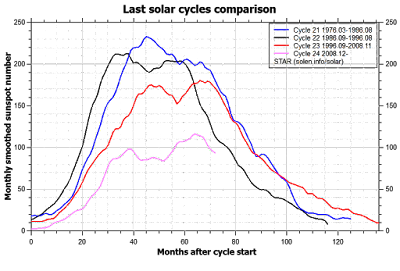 Zharkova's team analyzed data from California's Wilcox Solar Observatory, covering three solar cycles worth of activity from 1976-2008. All of their modelling predictions and observations were closely matched. "Looking ahead to the next solar cycles, the model predicts that the pair of waves become increasingly offset during Cycle 25, which peaks in 2022. During Cycle 26, which covers the decade from 2030-2040, the two waves will become exactly out of synch and this will cause a significant reduction in solar activity." This is not great news for HF DXers and 6 meter diehards as it sounds like the present wimpy cycle (Cycle 24) may have been a monster in comparison to what lies ahead. The one bright light is the likelihood of amazingly good low band (160, 80, 40m) conditions for many, many winters. I recall just how good conditions became on 160m during the solar-quiet winters between Cycle 23 and the eventual late start of Cycle 24. Night after night, the band opened to Europe like clockwork. Many nights the skip was so long that no signals from the U.S. could be heard at all ... just Europeans, often reaching 599 on my FT-1000's S-meter. At times I had to shake my head and double check that it was really 160m that I was listening to. LF and MF conditions were equally enhanced as the lack of D-layer absorption from a very quiet sun made tuning through the NDB band sound like 20m CW during the Sweepstakes Contest ... truly once-in-a-lifetime conditions ... but maybe not if Zharkova's model is as accurate as she claims. I guess we'll just have to wait a few more years to find out. 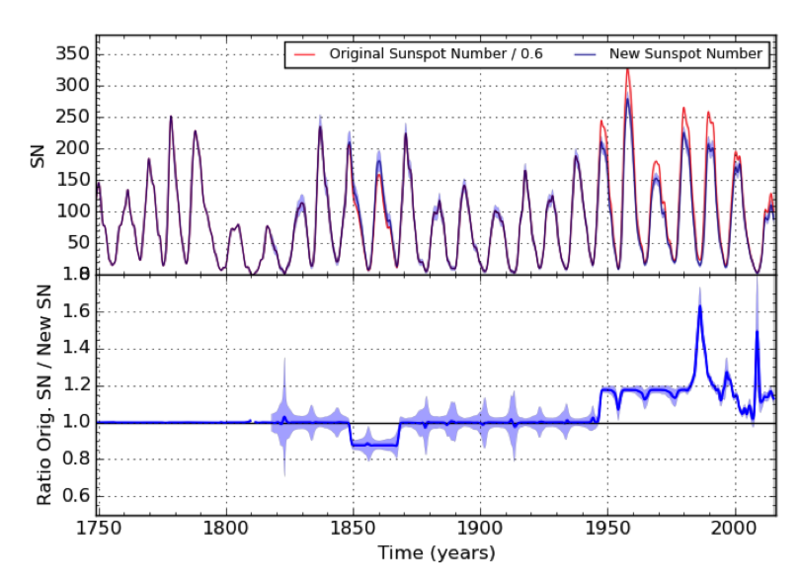 Although sunspot data has been recorded in one form or another for over 400 years, there have been few changes in the counting system since the introduction of the 'Wolf Number' in 1849. Recording of the sunspot 'Group Number' came into existence in 1998. It seems there were some strong differences in the two parallel series of systems and in 2011 a group of 40 experts undertook a full examination and revision of both systems in order to identify and fix the defects. The new system, which became effective on July 1st, has brought both systems into alignment, with the most notable correction being in the lowering, by about 18%, of all numbers after 1947. 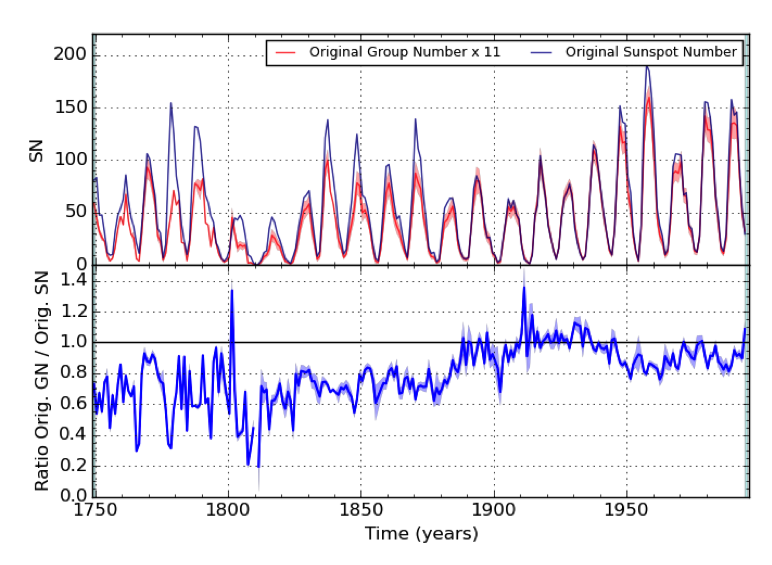 The new Group Number has been corrected for a large underestimate of all values before the 20th century and has resulted in a fully reconstructed series of Group Numbers. Viewed graphically, through my non-expert eyes, most of the earlier cycles up until 1947 appear to show slightly stronger peaks than before while those after 1947, including monster Cycle 19, show smaller peaks. 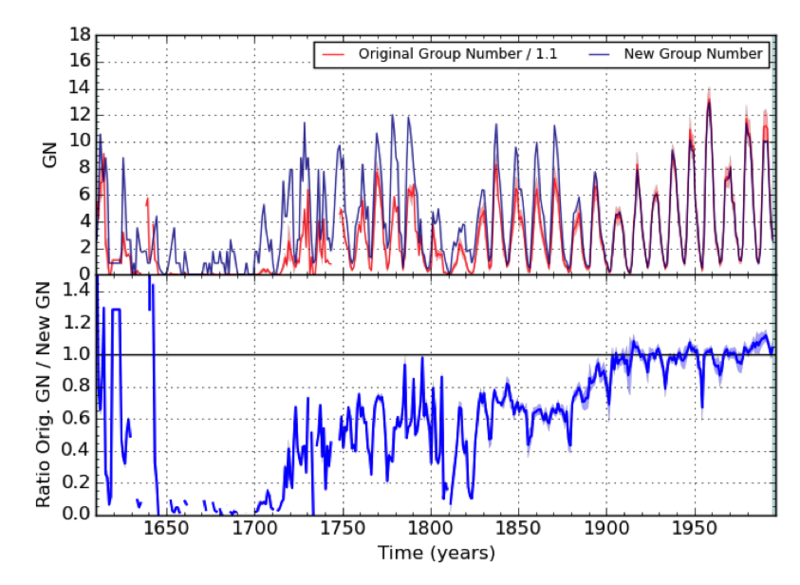 The graphic of Group Numbers shows significant increases for cycles up until the 1900's. 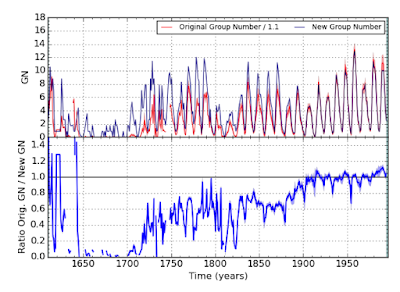 The new system brings the correlation of Group Numbers and Sunspot Numbers into harmony, unlike before. Still, as can be seen, significant deviations remain, mainly before 1825, when the observations become scarce and in periods of activity minima (low counts). So, more work definitely remains to be done for many years to come, but given the major improvements harvested at this stage, the WDC - SILSO is now going to proceed with the public release of this new version. The preparation of this major operation is now almost completed. It required a huge organizational and programming work from the small SILSO team. 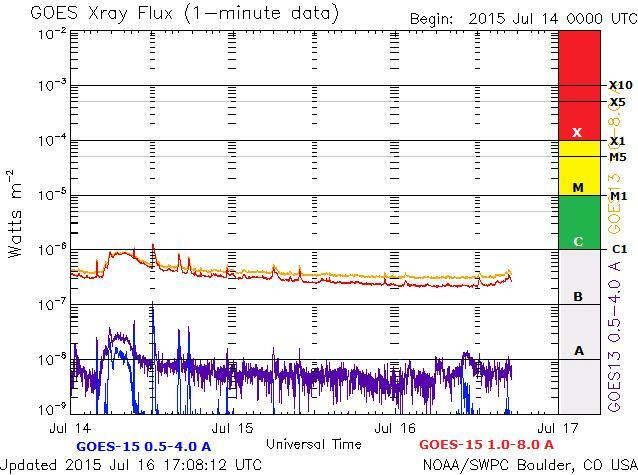 Indeed, the release of the new past Sunspot series is just a starting point for the WDC-SILSO. Indeed, it requires a deep reworking of the operational software that will process the data from our worldwide network on July 1st and in the future. 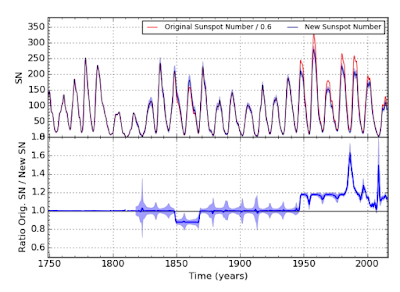 Indeed, various data products must be made seamlessly compatible with the new base total Sunspot Number series: the hemispheric Sunspot Numbers, the daily Estimated Sunspot Number, the 12-month solar-cycle forecasts, all data plots and the derivation of personal k coefficients for all stations of the network. After a rather uneventful life over the past 166 years, the Sunspot Number will thus be reborn in a new incarnation on Wednesday July 1st. We hope that the science community will welcome this revived data set and will appreciate the considerable community effort accomplished over the past four years to produce a better reference for long-term solar and Sun-Earth studies. The summer propagation doldrums, as well as my roof reshingling projects, received a short respite this week with the arrival of a new DXCC QSL for 160m. 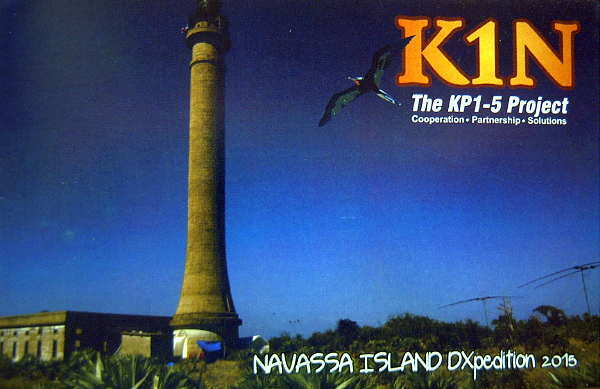 The K1N card (Navassa Island Expedition) was received for my CW QSO this past winter. The card brought my 160m DXCC total to 155 worked and confirmed while adding one more to my overall all-band total of 336 / 336. Sunday afternoon brought a rare and welcome 2m sporadic-E opening. Signals on 6m towards Colorado quickly rose from a normal 'S9' to ear-shattering S9 + 30-40db with one signal putting the S-meter of my IC-756PROIII hard against the right pin and completely blanking the bandscope's lower regions ... I have only seen this happen once before, when beaming semi-local VE7XF while he is running high-power. I immediately activated my Es MUF receiver (Icom R-7000), tuned to an empty FM frequency and squelched. Not long after, the squelch broke with a strong signal also from Colorado and several more throughout the band. It is difficult to ID FM signals as they rarely identify except at the top of the hour. After several CQ's on 144.200 (9el yagi and 150 watts) aimed to the SE, W9RM in Colorado popped-up briefly with an S9 signal and was quickly worked before he faded. Unfortunately, either due to lack of activity or fast-deteriorating conditions, his was the only signal heard. In terms of 'quality' of the opening, it was poor, but any 2m Es is always exciting. I once had a two-hour 2m Es opening to southern California and worked 32 Californians on 2m SSB before conditions faded ... it would be nice to see that once again. One of the fellows I worked that night had just set up his new 2m transceiver and, not being familiar with 2m propagation, told me 'I'll look for you again tomorrow night'. I told him that he could look for me for the next 20 years and he'd likely not hear me ... that opening was 32 years ago! Let's hope we get some more 2m Es before the season ends as it is one of the most exciting propagation experiences there is. Like Timex watches, the incredible Picosat balloons of Andy, VK3YT, 'take a licking and keep on ticking'. On May 23rd, Andy launched his PS-46 HF Pico balloon and on June 4th it had arrived back home, completing the circumnavigation of the earth in just 12 days ... but it kept on going. Although taking a little longer this time 'round, PS-46 arrived back over its starting longitude exactly one month later, on July 4th, completing its second circumnavigation of the planet! 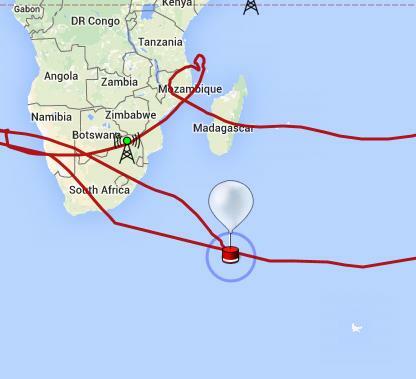 It slowed briefly enough over the Indian Ocean to trace out this interesting ground track. PS-46 is now on its third circumnavigation and, at the time of writing, was midway between New Zealand and the coast of Peru at 30,000'. PS-46 can be tracked via HF packets delivered via JT-9 and WSPR. Frequency information and tracking notes can be found on Andy's website for those interested in tracking the balloon themselves. As well, its track (and other balloons) can be followed on the Spacenear.us website. I think Andy's balloons are very cool and demonstrate a new aspect of amateur radio that was completely unheard of just a few years ago. The FCC is now officially inviting comment on its proposal to establish two new amateur bands ... the 2200m LF band (135.7kHz - 137.8kHz) and the 630m MF band (472 - 479kHz). The detailed proposal was published in the Federal Registry on July 2, thus establishing the comment deadline as August 31st and a deadline of September 30th for 'comments on the comments'. 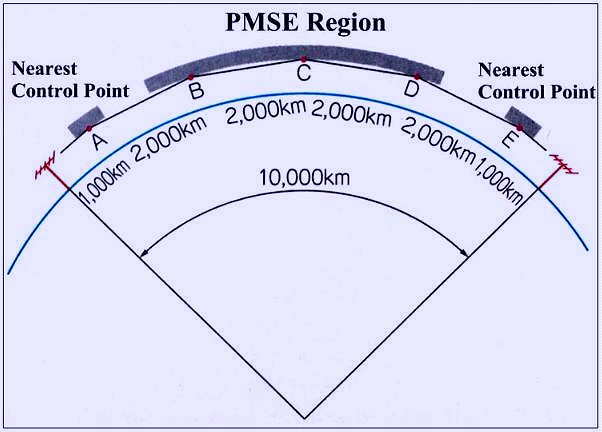 It is proposed that the Amateur Radio service would be 'secondary users' of this slice of the spectrum. Secondary users must not cause interference to the Primary users and also be willing to accept interference from the Primary users as conditions of operating. In reality, the only primary use of these bands in North America is for hydro distribution control (PLC) signals. Over several years of maximum ERP amateur experimental work, both here in Canada as well as in the U.S.A., there has been no documented interference to these signals nor have the well-shielded PLC signals been a problem for amateurs ... it seems that co-existence is readily attainable. 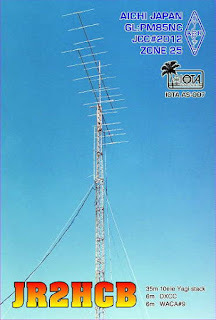 Whether you have operated on these bands or not (but especially if you have), I would urge you to file a comment expressing your opinions on any of the critical concerns (antenna height, power etc.) expressed by the FCC. All of these were listed in a previous three-part blog, starting here. If you think that you might like to operate or experiment on either of these bands in the future, then just tell them that as well ... the more interest from the amateur radio world shown, the better. For those of you that might think that this part of the spectrum has little to offer the amateur, I can assure you that such is not the case. Coast-to-coast propagation has been demonstrated on numerous occasions (on both bands). Both bands offer wide opportunities for experimental work dealing with antennas, modes and propagation as well as providing an abundance of homebrewing opportunities for builders. Comments may be filed, identified by ET Docket No 15-99 (proceeding number), via the FCC Electronic Comment Filing System (ECFS). As well, you can read all of the comments that have been filed here. U.S. amateurs have been waiting long enough (since 2007) for an opportunity to use these bands ... let's show the FCC that we really want them by filing your comments before August 31st! 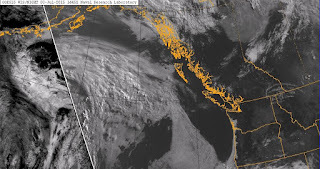 In a QSO yesterday with Mike, VE7SKA, on Saltspring Island, he alerted me to what appears to be a possible tropo path forming between here and KL7. Mike is, as far as I know, the only VE7 to have heard the KH6HME 2m tropo beacon (on several occasions) and even had a partial two-way with KH6HME in the 1995 duct to the PNW. Like our unprecedented early hot and stable weather pattern over the West coast, this path is fairly rare and has never really been explored ... this one appears to be forming a stable path towards Alaska. 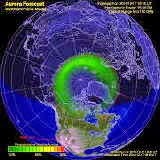 The predicted conditions can be viewed on Bill Hepburn's World Wide Tropospheric Ducting Prediction page. 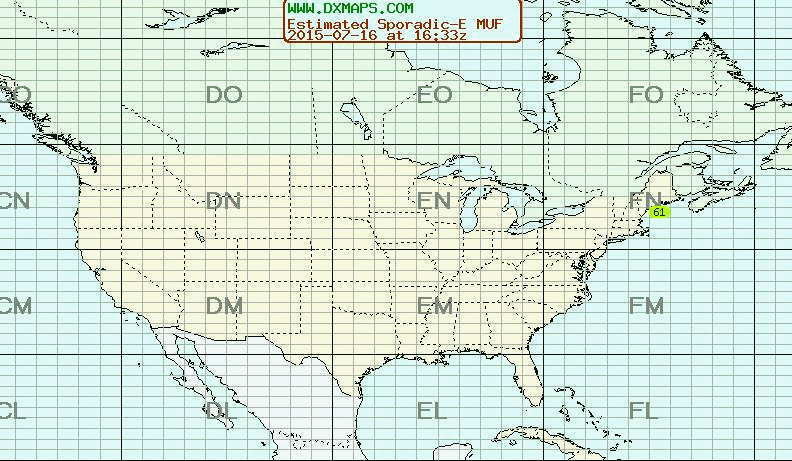 Select the Eastern North Pacific from the 'Region' drop-down menu and see the map for Saturday. Perhaps there are some KL7s near the water, or not too far inland and with a clear shot towards the southeast, that would be interested in running some possible tropo tests over the next few days if the path shapes up as predicted in the Bill Hepburn maps for the weekend. Not ever having explored this possible path before might yield some interesting results ... and who knows how far south into Puget Sound a tropo signal from the north might reach? Maybe it's time to find out. Of course, any stations between here and northern KL7 (Prince Rupert?... Juneau? ... Ketchikan?) might also be interested in trying a possible 2m path. 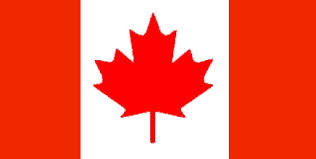 We always celebrate Canada Day with a large block party in our front yard by the beach, every July 1st.....pot-luck and lots of good food. The normal attendance is around seventy people but this year we may have a few less as it falls on an odd day. We have done this for the past 24 years and so far have never had rain. Today the weather is perfect once again here on Mayne Island.